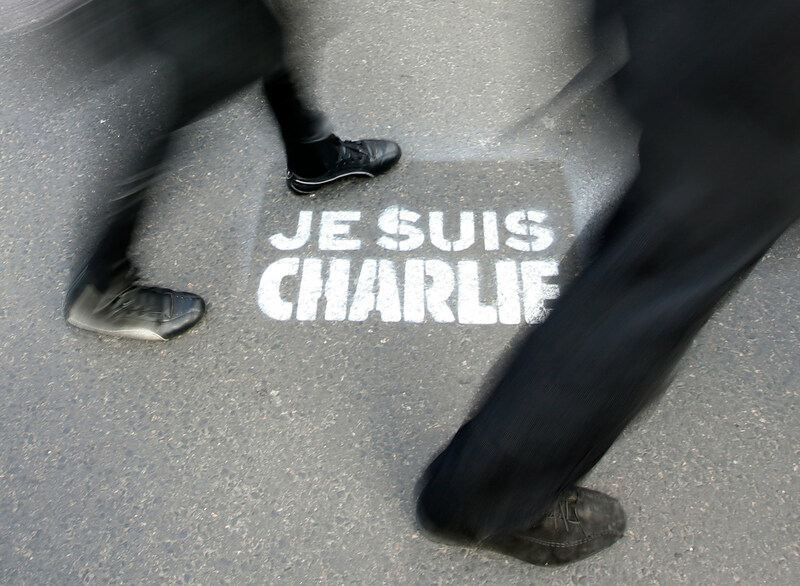 The country struggles with religion and integration one week after the Charlie Hebdo murders. The first excursion that my husband and I made after we arrived in Paris on a cold and rainy morning six days after the Charlie Hebdo massacre was a visit to the memorial for the murdered editors and cartoonists. “Catastrophe,” murmured one elderly woman, pointing us down the Boulevard Richard Lenoir. The memorial was a huge heap of sodden flowers—including an expensive potted orchid bravely blossoming in the January air—mixed with Tibetan prayer flags, posters and cartoons. ”Je Suis Charlie” was everywhere; someone had even made a piece of art in which the phrase was fashioned from real pens and pencils. One wall was covered with index cards featuring messages of sympathy from all over the world: Sri Lanka, Italy, Alabama. There were two big turquoise binders in which people wrote notes for the families of the victims. I wanted to write something, but as often happens when one is faced with bereavement, I didn’t know what to say, and I was already in tears, so I wrote a cliché: “My heart goes out to you.” The rain would wash it away anyway. A block or two from here, there was a smaller, similar memorial for the murdered policeman Ahmed Merabet. One handmade sign seemed to sum up the general feeling of fraternity and bewilderment: Le Monde est TROP GRAND pour tenir une seule vérité. The world is TOO BIG to hold one single truth. Like hundreds of other journalists, I went to Paris to write about the aftermath of the murders that claimed the lives of nine cartoonists and editors, one janitor, three police officers, and four Jewish shoppers at a kosher supermarket. But how is it possible, in a few days, to learn enough and understand enough and see and hear enough to write anything that is not simply a combination of random anecdotes and interviews shaped, inevitably, by what one already thinks—about free speech, multiculturalism, Islam, cartoons, France, foreign policy, feminism and even politeness? Take the French concept of laïcité. Everyone I spoke with wanted to talk about laïcité. But what is it, exactly? Like the United States, France enshrines the separation of church and state in law, but laïcité, which is usually translated as “secularism,” is much more than that. In the United States, especially in recent years, the accent is on protecting believers from government interference, including, as in the Hobby Lobby case, excusing them from following important laws that benefit hundreds of thousands of people and that everyone else must follow. Laïcité, by contrast, is overtly anticlerical: it’s the creation and maintenance of a religion-free public space. In America, which has always been a jumble of denominations, atheists are few and Christianity is vigorous and politically powerful, and conservatives tend to support a wider public role for religion. But in France, where Catholicism is on the wane and Islam is energetic, even Marine Le Pen supports laïcité. Laïcité once stood against the power of the Catholic Church, which was until 1905 the state religion. But it is probably not an accident that in modern times, the flash points all involve Islam. In 2005, after many years of discussion, girls were banned from wearing Muslim head scarves in public schools. (The law is neutral on its face: it prohibits all obvious religious dress, but nobody thinks it’s targeting Catholic kids wearing crosses.) As the Algerian poet and anthropologist Habib Tengour, who has lived in France since he was 5, put it to me when we met for coffee, if girls want to wear a head scarf, they can go to a religious school. (Right now that would mean a Catholic school, since there are few Muslim schools in France. And, indeed, some Muslim parents today prefer Catholic school for their daughters, as Tengour said was also the case in colonial Algeria.) Thus, one of the paradoxes of laïcité is that it can reinforce the very social exclusion it is intended to prevent: What is gained if a Muslim girl leaves public school so she can wear her scarf, or if Muslims in France, like French Jews, set up their own religious day schools? For Patrick Weil, a historian and political scientist who sat on the Stasi Commission that proposed the head-scarf ban, the ban is feminist because boys were pressuring girls into wearing head scarves and calling them whores if they didn’t. “The issue was a group of males against girls,” he insisted. Let’s say this was sometimes the case: If the problem was the boys’ behavior, is the solution to deprive girls of their freedom to choose their dress? In a way, that says it all. The obsessive attention given to the fine points of laïcité—women-only hours in a few public swimming pools is another flash point—seems a psychological displacement. It constructs Muslims as fundamentalist outsiders, when French Muslims have historically been moderate, even nonobservant, and many have done well economically and socially. And it overlooks the real problems limiting the integration of Muslims in France: high unemployment and underemployment, segregated housing, crime, inferior schools, a younger generation that does not see itself as having a future here. Given these obstacles to integration and upward mobility, it is hard to see how denying people their symbolic markers of religion and ethnicity is, in and of itself, going to result in their greater inclusion in the French republican project. Unfortunately, France is in the midst of an economic crisis, with high unemployment especially for the young; and the same laws that protect full-time year-round workers with steady positions make it hard to hire new people. Education has some of the same problems as it does here in the United States. An excellent French public education was the making of Tengour, who’s 67 and believes young Muslims are too quick to claim discrimination when the real problem is low qualifications due to the decline of the school system. But, he acknowledged, when jobs are scarce, Muslims lose out. Today, a young Tengour might pin his hopes on becoming a rapper or a drug dealer. It would be good to know more—a lot more—about the situation of Muslims in France, but a 1946 law prevents the collection of statistics by race, religion or ethnicity. As with laïcité, a rule invented to address one situation—the Vichy law forcing Jews to register with the police was later used to deport them to the death camps—has had unintended consequences over time. This lack of information is also part of “republicanism,” a concept of national unity that papers over differences due to poverty and racism. Almost the first thing that Catherine, my husband’s cousin, wanted to tell us when we showed up at her apartment was that the news media were reporting that some Muslim schoolchildren—she claimed 25 percent—had refused to stand for the national moment of silence for the Charlie Hebdo victims. Were they indicating their approval of the murders, as she assumed? Or did the children mistakenly believe that they were being asked to honor the caricaturing of Muhammad, as Nilüfer Göle suggested, and no one had taken the time to explain what the ritual was really about? Maybe, as a much older friend suggested, they were just being rude and noisy, the way kids are these days.